Task Finder provides an overview on active and inactive Tasks. Especially useful for managing large number of Tasks stored in multiple folders, Task Finder allows seeing them all in one place. 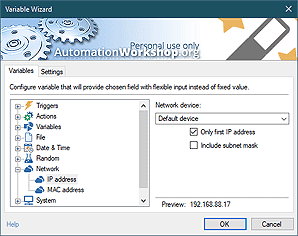 Task Finder allows to quickly locate Automation Workshop Tasks. It shows Task location, whether they are enabled or disabled and how many active Triggers and Actions they contain and which user credentials are used to run them. 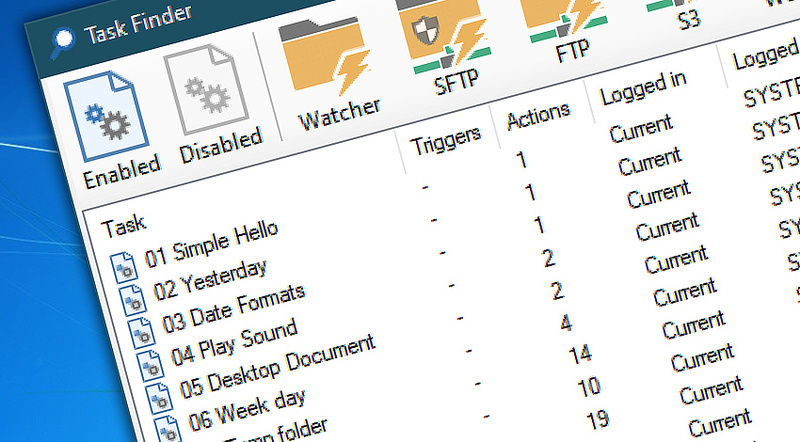 Find any Task by its Triggers, such as File / Folder Watcher, Task Scheduler or others. When the Task is located, you can go directly to the Task folder or open the Task properties to view or change its configuration, disable or enable. Task Finder allows to easier find and manage Tasks. Allows quickly locating particular Task in Task folders. Shows active and inactive Tasks. Shows the number of active Triggers and Actions in a Task. Allows quickly filtering Tasks by their name. Sort Task by name, number of Triggers or Actions, user credentials or location. Task Finder · using Task Finder to quickly locate the necessary Task. Automation Workshop is a magic that in my view is one of the very best! —Kenny A.